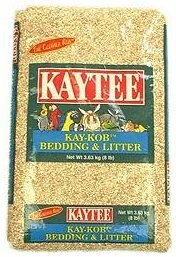 There are various brands but Brown's and Kaytee seem the most common. Kaytee calls their product Kay Kob but its still corn cob. 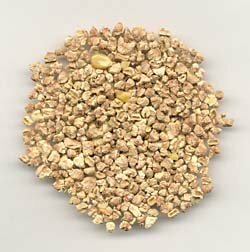 Corn cob seems to become mouldy easier than other bedding for some reason. And if your cavy eats the mouldy corn cob, it will be disastrous. Not only that, but corn cob breaks down into powder when wet. The concern of this powder causing eye or nose irritation leads me to not recommend this product. 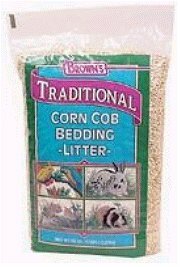 Corn cob is fine when used as litter in the litter tray, but I don't recommend using corn cob as bedding, even if a very generous amount of hay or straw is placed on top of it. This is 'cos cavies tend to dig so despite the hay, they might still reach the powder which I feel is not good. Kaytee's distributor is Tri Alba Pet Products which you can contact at 6466 0462 or trialba@singnet.com.sg. Supposed to be good at moisture absorbancy. Supposed to be good at odour control. Some cavies might find it uncomfortable. Will break down when wet. Powder may cause eye or nose irritation. Gets mouldy easily. Cavy may get ill if it eats mouldy corn cob.